Huashilai 3000 Re-Do —— Bring Out That Brass! Huashilai 3000 Re-Do – Bring Out That Brass! I started noticing a common problem showing up with many, but not all of my Chinese pens. Many of those that feature a black lacquered finish over a brass barrel have begun to blister and flake. So I decided to try to remove what was coming off anyway, and see how it looked. As t hese are really cheap pens to begin with, I figured there was really nothing to loose. I have several pens doing this, but for this experiment, I chose my Huashilai 3000 “Tiger Eye” to try stripping. To also be clear, I didn’t do a lot of correct prep work for this project, nor did I take the steps that I would have, if I were doing it again, knowing what it had the potential to turn out like. Basically, I just took the pen apart, put masking tape around the ends, covering the chrome trim, and started sanding with a fairly coarse 600 grit paper. This took care of the paint finish super quick. It also substantially scratched the brass barrel. I followed this up with a medium grade steel wool finally ending up with a super fine steel wool. The end result is…..ugly. Well it is. But, it’s also kind of cool in a sort of black-on chrome-on orange resin-on chrome-on brass-on chrome-on black sort of way. By not utilizing subsequently smaller grades of sandpaper before switching over to the steel wool, it left the pen with an instant sort of worn character. 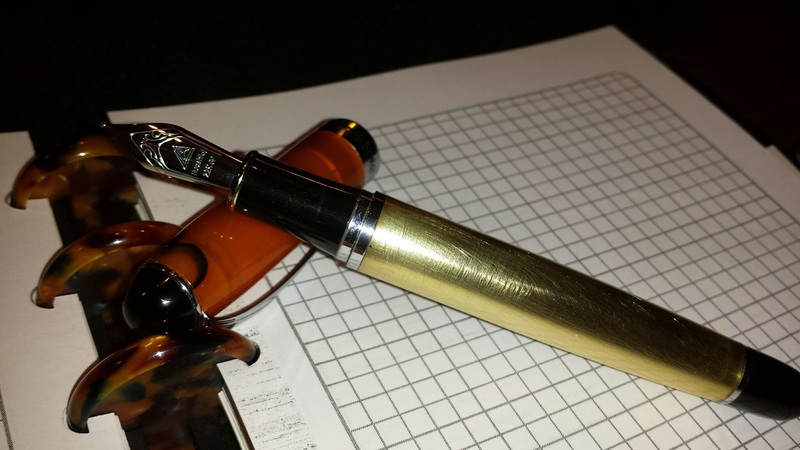 Author Will IsaacPosted on July 25, 2015 April 27, 2016 Categories Fountain PensTags Brass Pen, Huashilai 30003 Comments on Huashilai 3000 Re-Do —— Bring Out That Brass!